Andrea's Random Lil' Blog: A maid's life isn't all a sea of roses de arimasu! A maid's life isn't all a sea of roses de arimasu! As I was saying on a previous post, when Keroro arrives to Earth (Pokopen) he is found by Fuyuki Hinata and starts living with the family. There, Natsumi Hinata assigns him to all domestic chores - that were up to her until then, since Aki (the Mother) works 24/7 as a manga publisher. He agrees, of course, in exchange for staying in the house. In the first episode of the series, which I received yesterday, he gets acquainted to a vacuum cleaner. He loves it and gets so excited and so amazed with the appliance, that he ends vaccum-cleaning Natsumi's skirt, much to her justifiable fury, of course. That reminded of myself some years ago. We got that vaccum cleaner and, before I started working, I used to stay in the house, cleaning. One day I vaccum-cleaned a toilet roll. En entire one. Inadvertedly, of course. And I was so perplexed that I was unable to switch the thing off. I was just staring as the roll was quickly swallowed by the greedy, crazed device. Paper and, most impressively, cardboard roll. Needless to say Keroro was as well startled and could not manage to press the button to switch it off. Natsumi-chan was in a rage, of course, and could not stop calling him, "stupid frog". Yelling at him, that is... 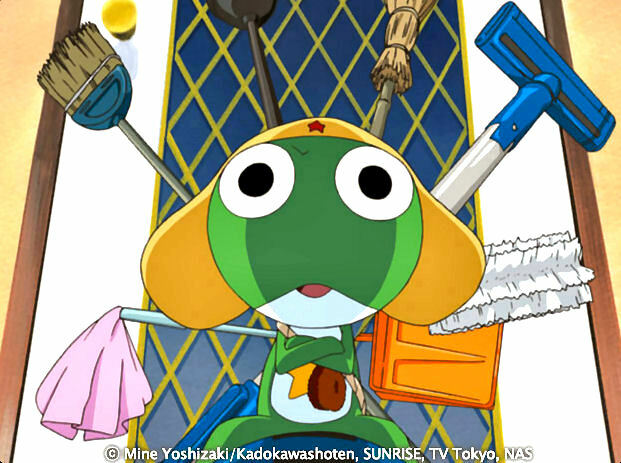 I so much identify with Keroro... We are very much alike, he he! (See, a maid's life is not easy).